Arbor Day trees are a symbol of the future just as our children are. If we nurture them and give them space to grow, we will see what a great contribution they make to our community. Select a good location for your tree that will allow plenty of space for it to grow tall as well as wide (at least 6 metres). Choose a location away from overhead powerlines and underground utilities. Spruce and pine trees like open areas and can also do well in shaded areas, so they are quite versatile. Call Alberta One Call before digging. Dig a hole 2.5 cm (1”) wider than the root ball and just as deep (about 3” for your seedling). Identify the root flare (where the trunk expands at the base of the tree) and check for proper depth. Once the hole is just deep enough for the root ball to sit even with the surrounding soil, you are ready to plant the tree. Place the seedling into the hole, making sure it’s straight, and begin to fill the hole with soil. Press down firmly so there are no air pockets or spaces around root ball. Fill from the bottom of the hole to the top. Firmly, but gently, pack the soil around the root ball. Use your hands to fill in the hole and pack the soil to ensure there are no air pockets and the plant has proper support. Water your tree and watch it grow. 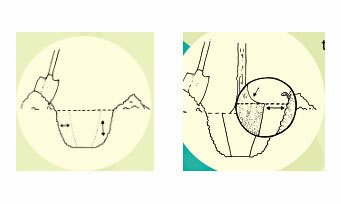 Ensure the hole the tree seedling is placed in is not too deep or too shallow. 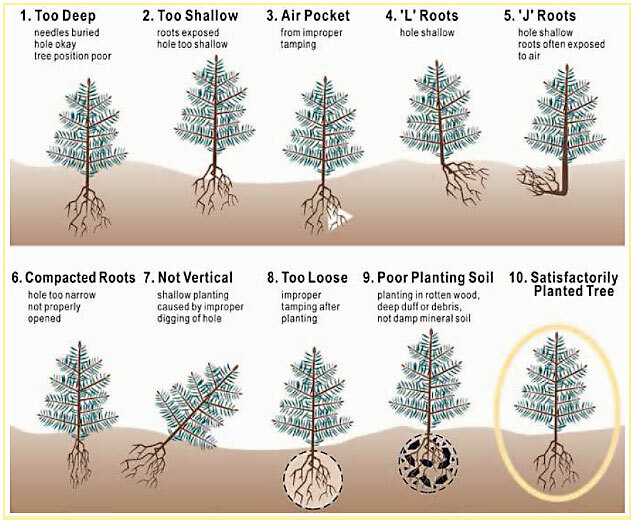 There must be no air pockets, otherwise root growth and tree alignment can be affected. The soil must also be fairly compacted (not too loose), and be of good quality. Learn about the two types of seedlings most commonly planted by Grade 1 students on Arbor Day in Edmonton. Need a location to plant your Arbor Day tree? Find a location on this map.